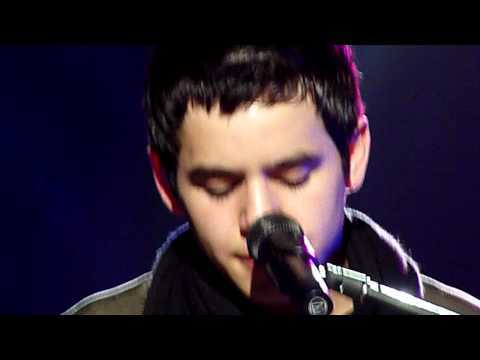 Songs David Archuleta has such a beautiful sound to his voice. It has a tone and quality that is soothing and pleasant to the ear. When he sings, he does it with so much emotion that he has the ability to connect with the listener. You feel the song with him. It is as if he has experienced heartache and deep love many times in his life and he understands. What makes that such a gift is that David is only a teenager and he has said in many interviews he has never had a girlfriend. He has never even had his first kiss. So in actuality, he has never experienced these deep emotions first hand. But from listening to him sing, you would never believe that. Just this past week at the ALMA Awards David sang a song in Spanish called “Contigo en la Distancia”. Translated into English, it means with you in the distance. It is a beautiful song about loving someone so much that they become a part of your soul and you can’t bear to be without them. Fellow Honeybee pikepss wrote about this performance in her article; David Archuleta – Masterpiece Performance ALMA Awards. It was an absolutely breathtaking performance. There is another song that I have heard David sing with that kind of beauty and emotion. The song is on David’s self-titled debut album and it is one of my favorites. It is a sweet love song that David sings so convincingly that when I hear it, it is as if I can feel the longing in his voice. The song is very moving and whenever I have heard David perform it ‘live’ in concert, it gives me chills. “To Be With You”was written for David by Emanuel Kiriakou and Kara DiGouardi and produced by Emanuel Kiriakou. It appears on David’s self-titled debut album for JIVE records. It is a song about longing for love to come into your life and waiting for that special someone you have dreamed of. It has a lovely arrangement with a violin which adds to the beauty of the song. Hey! I got those chills! And you said it all so well. David makes you feel the songs… I mean really feel them. How he does it is a mystery for sure! David really knows how to sing love songs, it as if he has lived through each one. Through his interpretation he reminds us of that one special love we have all experienced. Are we sure he is really 18? I love the simplicity of “To Be With You”. David’s voice and a lovely ballad in English or Spanish and I am there! I love the energy of Zero Gravity..but sometimes we just want to hear a romantic song from David. Thanks Katie for a great song choice and article! Ah! “To Be with You” — what a tender singer David can be. This song simply caresses with every note.